Ford recognizes the desire to drive a family-friendly vehicle packed with an abundance of comfort and convenience features. This is why the Ford Flex is the ideal choice for drivers looking for maximum comfort while on the road. This popular three-row midsize SUV has everything that you are looking for in a family vehicle. The Flex boasts seating for seven passengers, including two first-row bucket seats, a second-row 60/40 split bench seat, and a 50/50 split bench third-row seat. With a maximum storage and hauling capacity of up to 83.2 cubic feet, the Flex is ready for any challenge on the road of life. The ergonomic instruments and controls are strategically placed for maximum convenience. Get all the data that you need delivered to the perfect place. 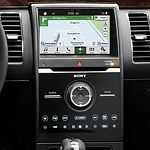 From controls on the steering wheel to the information in your line of sight, the Flex makes driving easy.